For any individual seeking a party bus in Clinton, then you should know that your search has finally come to an end. Here at Rockstarz Limousine and Party Bus, we are a company that can provide you with not only the perfect location for your party, but a fully professional service from start to finish. If you have ever tried to rent a party bus, then you may be familiar with the concern that you will have enough space to allow all of your guests to attend. With us, that is no longer an issue as we have sought to make the maximum possible use of the space in our bus, without having a negative impact on the party itself. Our Clinton party bus rental option is going to give you and your guests the ideal location, which will become all too apparent from the moment you board. Just imagine being able to cruise around the city in your own private nightclub on wheels, and you get an idea as to what to expect. Whether it be the state of the art sound system, or the laser light show, the atmosphere that can be generated from within the bus is going to blow your mind. Throw in some luxury leather chairs to rest as the party continues around you, and this is going to be an experience that nobody is going to ever be able to forget. 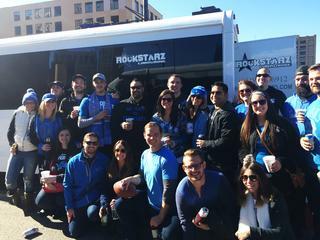 In the past, people have used our Clinton party bus service because of a variety of celebrations. No matter if you are seeking a location for a birthday or anniversary, a bachelor or bachelorette party, or perhaps even just a cool location for some fun, we can help. So, if you live in the Clinton area and are looking for a party bus, then give us a call here at Rockstarz Limousine and Party Bus. Alternatively, you can contact us via our website and someone will be in touch as soon as possible. Please leave your name, best phone number to contact you, email address, and requested rental date. This will ensure the quickest response with this information. THANK YOU FOR YOUR BUSINESS. Please enter a number from 1 to 99.